B&G Lowering Springs 2011-2014 Chevy Volt5BrandonAugust 31, 2016These are exactly the same as the PI lowering springs talked about on the chevy volt forums. Provide a 1 inch drop all around and very sporty handling change to the volt. Clearance is roughly the same although the stock shock absorbers have to work alittle bit harder and do bottom out on potholes. wish this company also made some sport shock absorbers to match! Would buy again, keep in mind the car will maintain its raked stance. aka the back will be higher than the front. When you think of upgrading your Hyundai suspension and lowering your vehicle, you probably have some of the same priorities in mind that B&G Suspension does. B&G Sport Lowering Springs for Hyundai are engineered to improve handling while maintaining safety and ride quality. 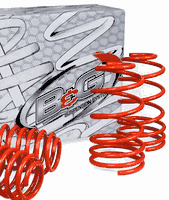 B&G Sport Lowering Springs for Hyundai also will give your vehicle an aggressive look. B&G Lowering Springs for Hyundai have all of the features that you're looking for: First, B&G Hyundai Lowering Springs feature progressive spring rates. This means that they have multiple spring rates to maintain a quality ride while significantly improving handling, cornering, and providing an aggressive vehicle stance. To top it off, B&G Suspension is so confident in the superior quality of their Hyundai lowering springs and suspension products that they offer a lifetime warranty on them. The part number for this item is: 12.1.017 and it fits: 2011-2014 Chevy Volt models. This set of 4 springs will lower your vehicle by 0.8" in the front and 0.8" in the rear.